Performing in pointe shoes and tutus takes its tole on an aging body. Many dancers are familiar with the repercussions of a life of performing. The members of ‘Les Ballets Trockadero de Monte Carlo’ the all male drag ballet company, who perform on pointe with custom shoes face unique challenges to their bodies as they age. 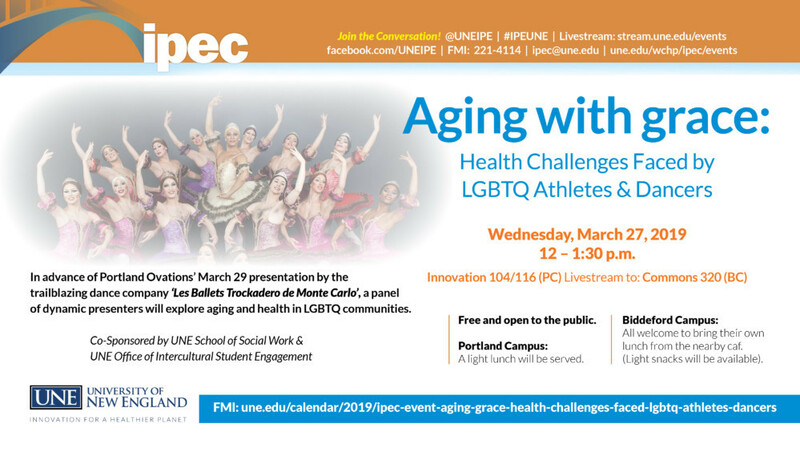 In advance of their March performance, a panel of dynamic presenters will address the topic and explore aging and health in LGBTQ communities in a discussion presented by The Interprofessional Education Collaborative at University of New England. This free and public event will be held at UNE’s Portland Campus and live streamed to their Biddeford Campus. Light lunch will be provided.